onRamp to Algebra is an intervention program designed exclusively to ensure that at-risk students are adequately prepared for Algebra 1. 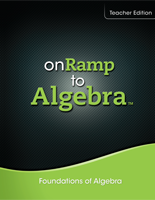 The program is ideally implemented the year prior, to build and solidify foundational skills and conceptual understanding necessary to be successful in Algebra 1. onRamp to Algebra is a complete instructional system that utilizes technology to deliver online homework support and in-class presentation screens for whole class participation. Although the program can be implemented solely with the printed Student and Teacher editions, it is optimized when coupled with in-class technology such as whiteboards/projectors; as well as when students access its online learning aids, which provide scaffolded, point-of-use homework support. As such, the program is designed to grow with your schools’ Technology Plan. onRamp to Algebra is designed to be delivered in a single block class period. Each of the 112 lessons utilizes a classroom Workshop Model, designed to ensure that your formerly struggling students are constantly active, and engaged, participants throughout the entire 45-minute class. Built-in “Coach” supports (throughout the Teachers Edition), along with a Program Overview & Implementation Guide, and onsite and/or online Professional Development, ensure that all teachers are successful in the implementation of this program.